The story of the Mars Orbiter Camera (MOC) onboard the Mars Global Surveyor (MGS) spacecraft began with a proposal to NASA in 1985. The first MOC flew on Mars Observer, a spacecraft that was lost before it reached the red planet in 1993. Now, after 14 years of effort, a MOC has finally been placed in the desired mapping orbit. The MOC team's happiness is perhaps best expressed by the planet Mars itself. 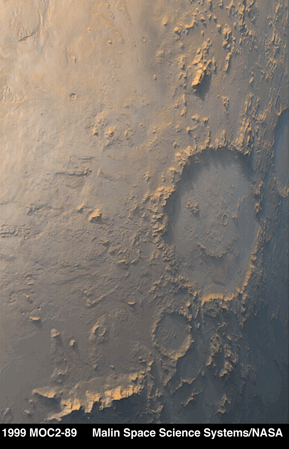 On the first day of the Mapping Phase of the MGS mission--during the second week of March 1999--MOC was greeted with this view of "Happy Face Crater" (center right) smiling back at the camera from its location on the east side of Argyre Planitia. This crater is officially known as Galle Crater, and it is about 215 kilometers (134 miles) across. The picture was taken by the MOC's red and blue wide angle cameras. The bluish-white tone is caused by wintertime frost. Illumination is from the upper left. 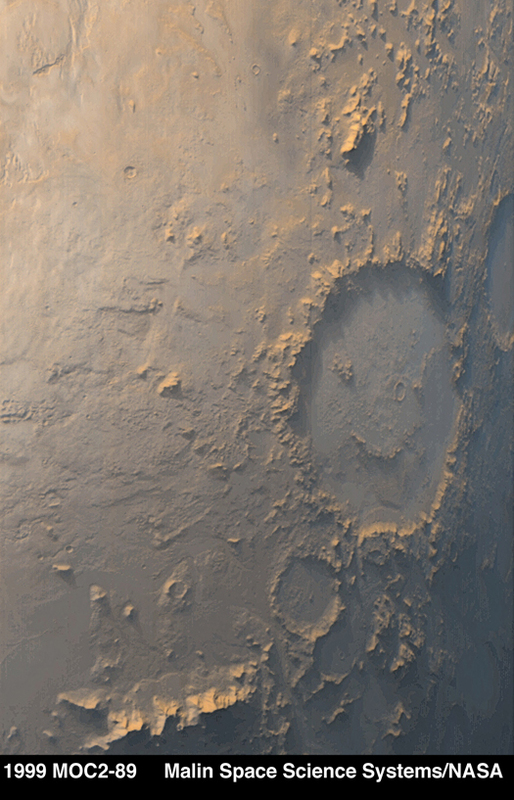 For more information and Viking Orbiter views of "Happy Face Crater," see http://www.msss.com/education/happy_face/happy_face.html.